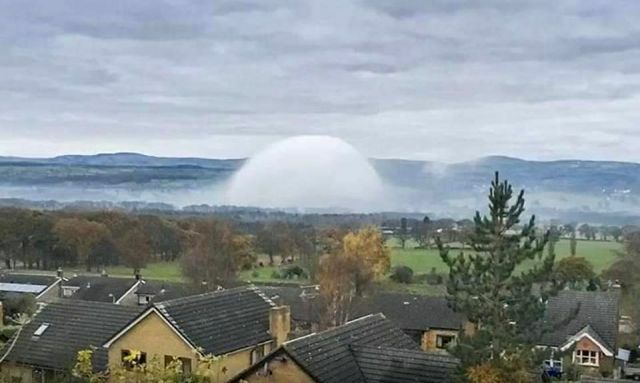 A rare UFO-like ‘fog dome’ has been captured by a local Hannah Blandford near Tremeirchion in North Wales on at 8 am on November 2, 2016. ‘I couldn’t believe how perfectly dome shaped it was, it looked amazing, so I had to take a photo she said to the Dailymail. I’d never seen anything like it before, it was really quite special. I watched it for about 10 minutes and then the dome started to flatten and it looked like very thick low lying cloud. It spread out across 12 fields and covered a huge area. Cold weather alerts have been issued for much of the UK as temperatures plummet to -4 °C on the coldest weekend of the season. That is Haarp in full effect, you need to get it removed from wales asap, and approach your parliament.